If you have decided to have your beach wedding in Bali, finding the perfect beach for you and your fiancé to celebrate your love is vital! The team at Your Bali Wedding will assist you in finding the wedding location of your dreams. Whether you want a wedding extravaganza, an intimate traditional ceremony, or a wedding dedicated to your mutual love of the surf we’ll find it for you. The tranquility and peace of Jimbaran Bay makes it a dream location for a couple looking for the ultimate romantic wedding. Jimbaran Bay located in the south of Bali is famously known for it’s superbly fresh seafood and chilled out holiday vibe. The area is surrounded by ancient temples, which exhibit the best of Bali’s traditional architectural skill. Some of these temples are still used for daily religious ceremonies and are a definite must see! The white sand shoreline is dotted with tens of fresh seafood restaurants each offering a unique Balinese flavour experience. The seafood is prepared on the spot from the local fishermen’s early morning catch. You can enjoy your meal in the comfort of air-conditioning in any of the family-owned restaurants or for a full sensory delight; you can rest your feet on the softest sand whilst taking in the natural beauty of the calm crystal clear waters of Jimbaran. The scene at the bay is ideal for your pre-wedding photo shoot. The bay is cushioned by luscious tree covered mountains and you will surely be blown away by the iconic sunset over the horizon. Bali Villa Escapes has luxury 3 and 4 bedroom wedding villas right on the waters of Jimbaran Bay. 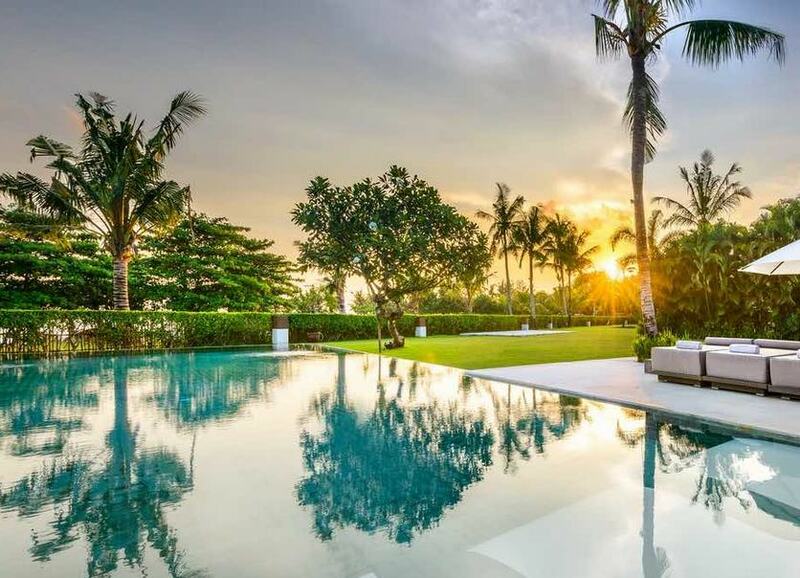 Each villa has it’s own private pool and assistant to take care of your every need. Many Australians fall in love with Bali because of the unbeatable surf breaks. Uluwatu is one of Bali’s most famous surfing spots. Getting into the surf at Ulu isn’t so simple but if you are an adventurous surf fanatic Uluwatu is definitely the beach for your wedding. My first visit to Uluwatu was unforgettable. I sat down at a warung and slowly became hypnotized by the harmony of the waves, the gentle sea salt breeze and by the vision of the surfers effortlessly catching some epic breaks. The view from the top of the cliff is magnificent. Untainted open-ocean contrasted with luscious green grass covered cliff offers an idyllic tropical wedding location. If you and your fiancé are passionate about surf sand and sun then you will love staying in one of the many fabulous villas with ocean views in Uluwatu. 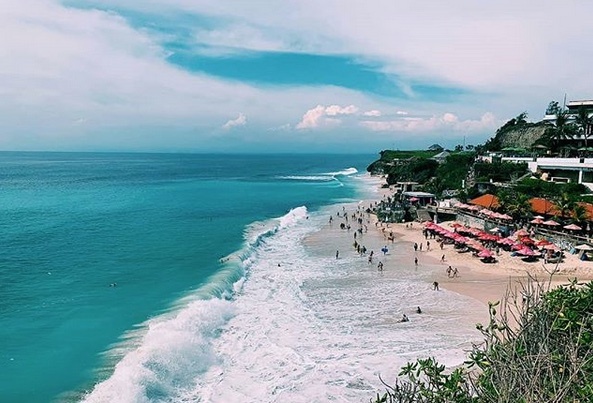 Just a short motorbike ride away from Uluwatu, Balangan beach is easily accessible from the street making it more appropriate for a large wedding celebration. Balangan is surrounded by tall palm trees, mountain tops and endless green fields. It is best known as Bali’s beginners beach with it’s many surfing schools and café’s along the sand relaxing to Bob Marley tunes. The serenity and relaxed vibe of Balangan is unique. It is the ultimate escape from the hustle and bustle of busy Kuta and Seminyak. Its multi-leveled walk down to the sea gives you the option of having your reception either high up on a leveled mountain-top with a magnificent view of the horizon or right on the sand where the calmly crashing waves can cool your beach loving feet. 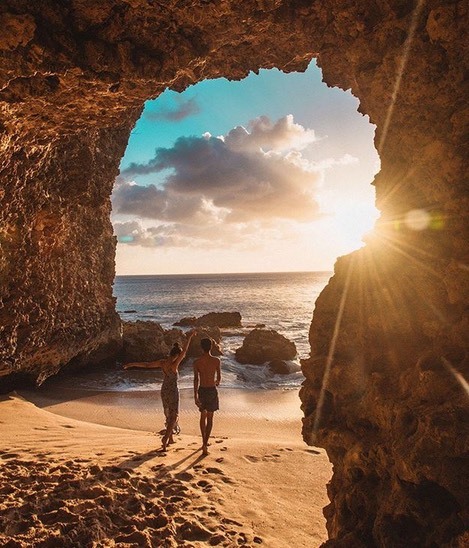 For the couple seeking a truly intimate wedding with just a handful of loved ones; Bingin beach is one of Bali’s best-kept secrets. This discreet beach is not over-crowded with tourists cafes or surfing schools; meaning that all you can hear is the clear blue waves crashing on the sand. Bingin is located in the more rural ‘country-side’ of Bali. On the drive there, you will have the pleasure of sharing the road with many cute and adorable farm animals roaming around the winding streets and many sleepy dogs taking a midday nap underneath the palm trees. 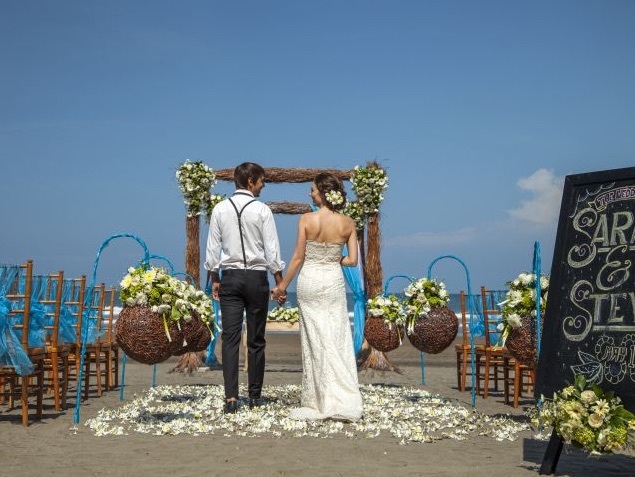 Dreamland Beach is a great wedding location for a couple who loves the non-stop energy of Kuta but also desires a tropical pearly white sand overtone. Dreamland Beach on Bali’s southern coast has recently been dubbed New Kuta Beach. Dreamland has been growing in popularity for surfers and pleasure seekers flocking to Bali in recent years. Dreamland boasts an eclectic mix of restaurants, bars and day spas ensuring you’ll be able to get the best pre-wedding treatments you deserve. Like many beaches along the southern coast you’ll be able to find that perfect Balinese mix of surf and open green fields. We have focused here on the southern part of the island in the Bukit area but we can also organise beach weddings for you in other really popular tourist areas like Seminyak, Canggu as well as Legian which also have gorgeous beaches with their own special ambiance. These are really very popular beaches due to the proximity of many hotels and villas so you will have to book well in advance. Also take note of the time of the year as some beaches on the west coast of Bali will get very wet during the rainy season which is not ideal for a beach wedding. The rainy season in Bali is between November and February so if your planning a beach wedding during these months you should probably be having it on the drier East Coast; on the Sanur side. We are adding 2 more beaches here to our collection; Seminyak & Canggu. These are extremely popular areas in Southern Bali and are basically the tourist hubs. Having your wedding on either Seminyak or Canggu beach is fabulous due mainly to the great sunset photo opportunities. And if like most other travellers coming to Bali, your probably staying in one of our Seminyak villas. This means you and your guests do not have far to travel to get to the wedding ceremony and the after party if held at the villa is a short drive away. Also read: Seminyak or Canggu, where should I have my wedding?